- Added a background galaxy to the galaxy display. It actually took quite a bit more work than you'd think; I had to figure out how to draw parts of the stars transparently, and part opaque, which required figuring out the Cocoa drawing methods and making additional masks and such of the star images. But... I did manage to get the effect I was looking for, with the galaxy fading out as you zoom in, and more prominent zoomed all the way out. 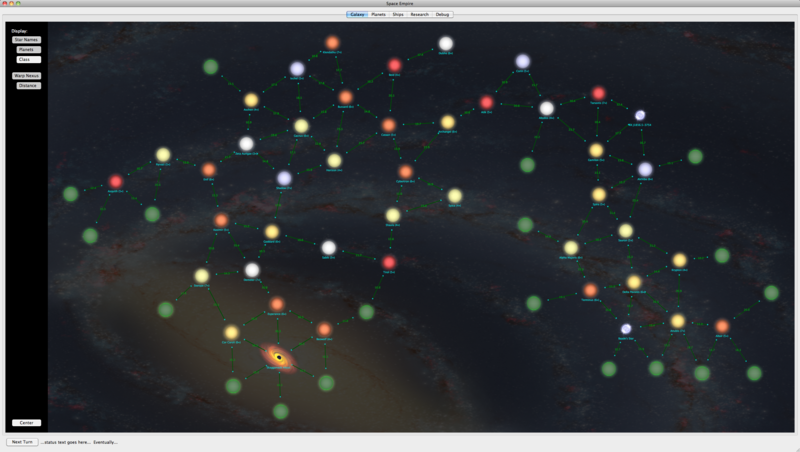 I also changed the overall galaxy shape and creation process to match. - Did some optimization to speed up scrolling and zooming, i.e., fixed off-screen rendering (i.e., so it doesn't happen) and added a bunch of smaller versions of all the images so it can draw things faster when zoomed out -- I might do a little more work there, it's responsive, but it's still not nearly smooth enough to make me happy. Instead of enforcing scrolling so you can't go off the map, I let you do whatever you want, so added a center button if you managed to get lost off the edge, or just want to zoom out more quickly so you can go somewhere else. - Changed the look of the screens so that they're more uniform (mainly the tech screen). I also changed the buttons so they look better on black (which ended up giving them kind of a "Star Trek" feel which I like). I also integrated debug into the existing screens and removed the dedicated debug screens (basically, you can toggle on debug to make everything visible instead of just what would normally be visible). 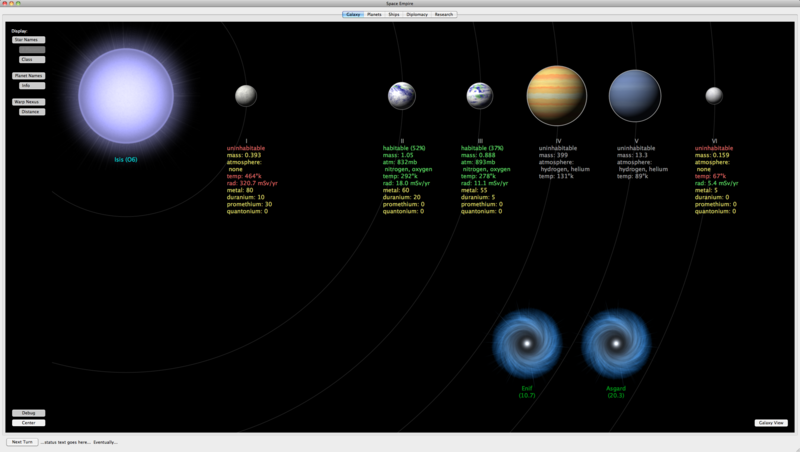 - Added a system screen that shows, well, the planetary systems. Added more controls to handle that, as well as planetary information with colors based on habitability. I also upped the minimum size a bit so that was more readable. - Added a startup screen, with options to set the galaxy size and research rates. - Went through all the existing code and refactored out a huge number of NSNumbers I don't really need (replacing them with floats and ints). How can you be so productive with insomnia? I can barely bring myself to go to work and I get plenty of sleep.